Trackmobile’s design philosophy is to build the best machines that efficiently and safely move our customer’s railcars, so all Trackmobiles come equipped with a certain set of standard features. 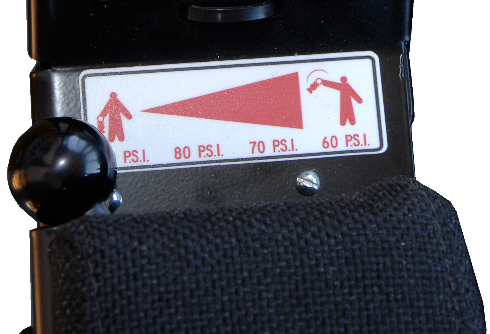 Train air braking can be managed from the operator’s seat with a convenient armrest control to deploy train air in increments of 10 psi. The Train Air Hold feature can also be used to apply brakes in smaller intervals, allowing multiple railcars to be braked more gradually. 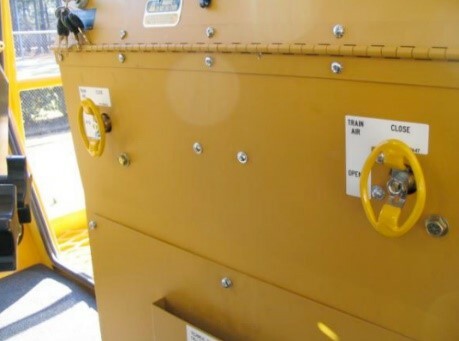 Trackmobile also offers an optional on-board train air charge indicator that monitors the brake pipe air flow when charging railcars and can be viewed directly from the operator’s seat. When the number on the gauge drops to zero or levels off, the brakes are fully charged and capable of braking at their fullest capacity. The tractive effort of a rail vehicle is dependent upon its weight, so Trackmobile maximizes tractive effort through the process of weight transfer, a simple means of increasing the weight of the downward pressure on the railwheels by borrowing weight from the railcars coupled to it. This is done by coupling to a railcar and using an easy, finger-tip control to raise the coupler. This process can add up to 99,000 lbs. (44,905 kg. )* to the Trackmobile’ s weight, effectively increasing its tractive effort. The Safe-T-Vue system is a patent-pending camera system that provides a 360 degree virtual view surrounding the machine that eliminates blind spots. Safe-T-Vue offers unparalleled visibility during the railing of the Trackmobile and coupling and uncoupling railcars through the use of its proprietary video image support. The surround view function allows the operator to immediately recognize potentially dangerous traffic or pathway situations. Operators get an enhanced view of areas that would normally be difficult to negotiate – this means better, more efficient maneuvering and better ground crew spotting around the machine and between the machine and railcars, increasing safety and saving both time and money. For quicker response time and control when moving many cars, our long life 100 CFM Rotary Compressor provides 100% duty cycle at maximum RPM even at low temperatures. Our railcar movers provide everything you need to keep crews productive. Industrial grade Airend design built for 100% duty cycle, 24 hours per day, 365 days per year at maximum rpm. Standard on T4 Atlas, Titan and Hercules models. Heavy-duty 2” [51 mm] thick rotating mainframe oscillates up to 10° assuring 4-wheel rail contact. Standard on Titan. Heavy-duty 6” [152.4 mm] thick split pivoting maingrame with 8” [203 mm] mounting plate with oscillating bearing that pivots up to 10° assuring 4-wheel contact at all times and extends axle life. Standard on Atlas. Expanded seating for additional crew members, training purposes, or inspectors. This wall mounted, padded seat is spring loaded and includes a seat belt for safety. For additional 3rd crew member seating, the seat can be mounted on the engine side cab wall of the Titan model. Neutral braking is a feature that gradually applies the Trackmobile’s service brakes after 5 seconds when the transmission is shifted into the neutral position on the joystick. It is important to note that this applies the Trackmobile hydraulic service brakes. The park brake is another independent brake applied by the park brake switch on the instrument panel. Neutral braking occurs when the transmission is moved to the neutral position and the joystick is released, allowing it to return to its resting position.